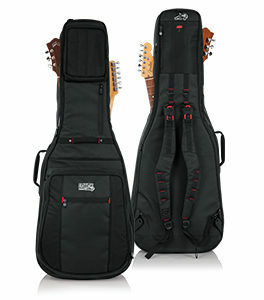 Gator Cases Deluxe Pro-Go Series Guitar Gig Bags provide professional level protection and exceptional mobility, ideal for musicians on the go. And now you can double up in style with the new dual gig bag designed to fit an acoustic and electric guitar. The plush, white, micro-fiber interior will protect both your acoustic and electric guitars in separate compartments with ultra-thick padded side walls. The interior features an adjustable body block shock absorbing pad and adjustable padded neck cradle to keep the guitars securely in place. The rugged nylon exterior incorporates a unique padded backpack system that is adjustable and completely removable. The reinforced top and front carry handles allow you to easily grab and load your gig bag into a vehicle or gently set the bag down flat with ease. The bottom of the bag includes rubber protective feet to prevent scuffing and wear. The Pro-Go Acoustic / Electric Gig Bag offers ample storage with a large exterior front pocket perfect for sheet music, with cable management straps and separate micro-fleeced lined tablet pocket as well as an additional accessory pocket on the top of the bag for quick-grab items. Lastly, a slight change in the weather is nothing to fear as a wrap-around protective rain cover is built-into the bag. The rain cover stores neatly in the rear zipper compartment and its handle cut-out allows for a snug fit.